“Here began all our troubles.” For Captain Cook, Cape Tribulation was a bit of a headache. Not only did his pioneering ship run aground here in 1770, hopelessly dashed on corals, but even when he and his crew successfully made it to shore it was uncertain whether they would ever set sail again. In his diaries he explains how his “heart sank” when he summited Grassy Hill to get the lay of the land; only to discover the channel wasn’t one to be easily navigated. 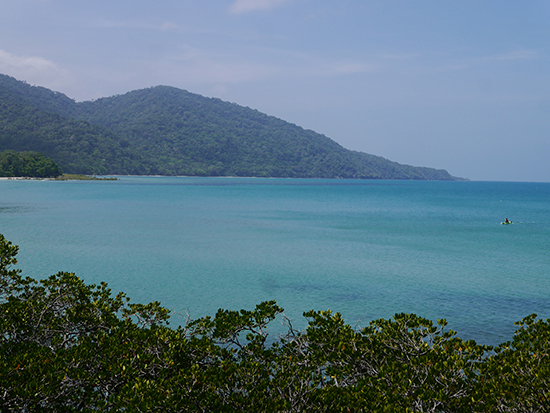 But while Cape Tribulation – as the name suggests – was a source of stress for Cook, today’s visitors will experience anything but. This iconic headland, famed for being the spot where the rainforest meets the reef, is sandwiched between the ancient Daintree National Park and the technicolour beauty of the Great Barrier Reef. It is, quite simply, a verdant paradise, emerald palms spilling onto soft white sands and into the turquoise patchwork of the Coral Sea and its reef within. Another deep breath. I knew it was going to be a painful transition from the cool air conditioning of the bus to the muggy warmth of the rainforest outside. Two steps down and my assumptions were confirmed. Within minutes sweat was clinging to my back and my hair was doing its best Diana Ross impression to date. 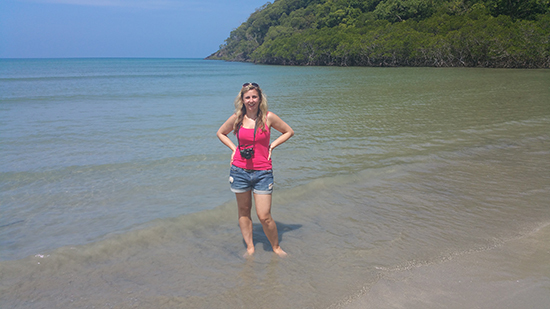 It clearly hadn’t got the memo that we were on our way to Cape Tribulation, and that I needed to look semi-presentable for the obligatory beach snaps. 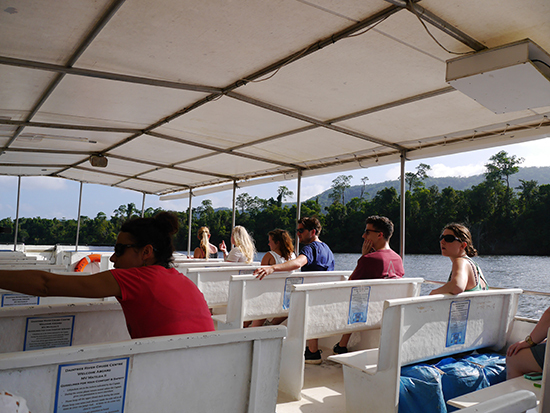 Before we reached Cape Trib (as our Down Under Tours guide Pete affectionately dubbed it), we were first going to delve deep into the rainforest. 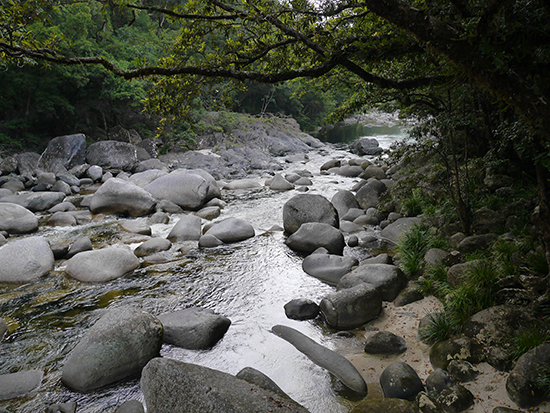 The journey began at Mossman Gorge, just 12 miles inland from Port Douglas. After being initiated with an ancient aboriginal smoking ceremony, reinforcing our imminent cohesion with the surrounding jungle, we tramped past towering strangler figs, clambered over far-reaching roots and shrubs and negotiated high wooden walkways. It felt like we were in a fairytale wonderland, the stuff of Famous Five books, clad with moss and brought to life with the sound of raucous bird calls, not to mention the enchanting tales of the rich heritage of the Kuku Yalanji people. Gazing out from lookout points dotted between tree trunks, we clapped eyes on the mighty Daintree River. Interspersed with mammoth, green-tinged boulders and cascading waterfalls of varying size, it was undoubtedly the jewel in the Gorge’s crown. 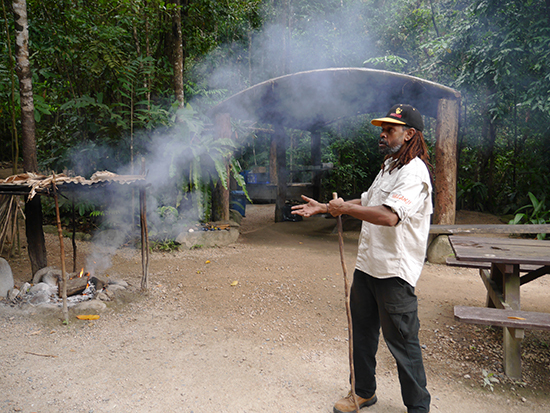 With our heads full of incredible indigenous stories and our stomachs comparatively empty, we stopped for lunch at a tranquil spot in the heart of Daintree. The Heritage Lodge & Spa greeted us with fresh barramundi, juicy cuts of rib-eye and a setting overlooking our favourite river once again. 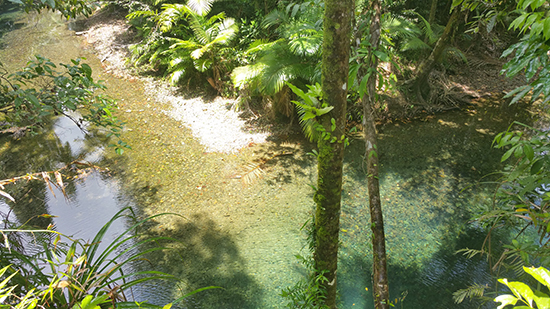 We ate fast, distracted by the prospect of a nearby cassowary sighting – a large, flightless, prehistoric bird, native to Australia and New Guinea – as well as the inviting clear blue water beneath us. We neither saw the cassowary nor took a dip in the river pools, but the idea of both (and our full bellies) filled us with energy and excitement for the afternoon ahead. We re-boarded the bus bound for Cape Trib and Pete told us a bit more about the elusive southern cassowary – from its brightly-coloured plumage and dagger-like middle claw, to its favourite fruit: the toxic-to-humans cassowary plum. We got so wrapped up in his enigmatic description of this shy bird and its habits, that we didn’t even realise we’d reached our destination until the doors swung open and a cloud of 34-degree heat permeated the cool confines of our vehicle. We hopped off, greeted by flecks of sand that had blown onto the car park tarmac, and headed straight for the Cape Tribulation lookout point. A short, uphill stroll later and the landscape came into view. Sugar-white silica shook hands with turquoise gentle waves and meandering mangroves, all framed by the dark shadows of the colourful Great Barrier Reef. So this was what all the fuss was about. Our group took in the vista silently for another few minutes before the call of the beach reached our ears. And, as if by magic, the day continued to amaze and astound. 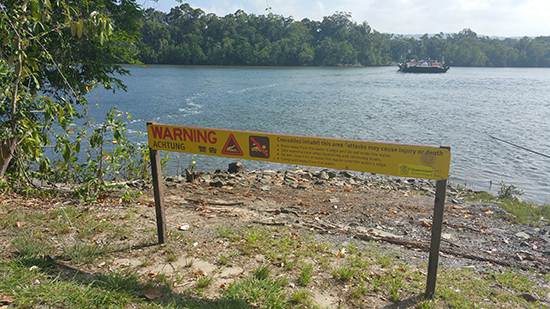 We’d seen croc warning signs dotted along the riverbanks throughout the trip and even at Cape Tribulation, but we’d yet to spot one. 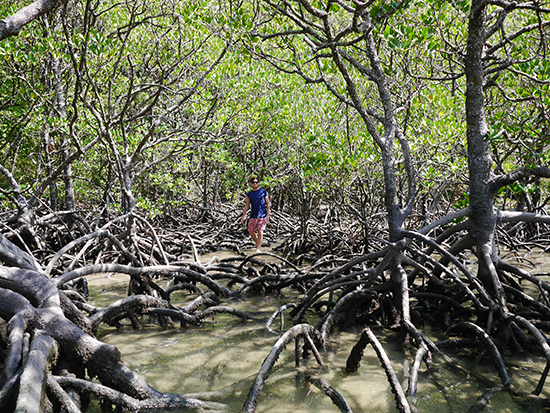 We departed the beach and circled back to the Daintree River, hoping to change that. Led by the knowledgeable river guide Jarrah, we boarded a boat in search of ‘salties’. It wasn’t long before our eagle-eyes were sated. 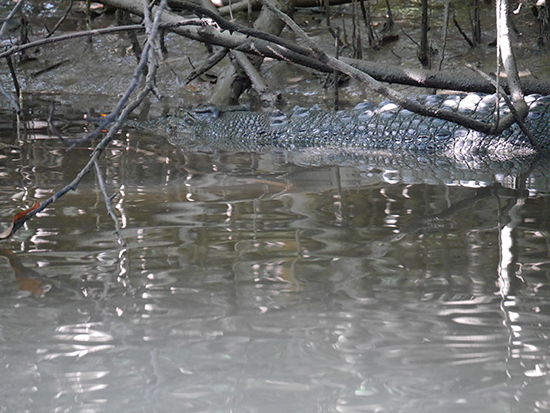 First we saw a baby croc, just coming up to two years old Jarrah suggested, followed by a full-size female, a whopping two-and-a-half metres long. Moments later we spotted her wannabe mate or as Jarrah called him: Scarface. Scarface – so named because he’d recently had a messy run-in with the river’s alpha croc – was nearly twice the size of his lady friend and, despite the muddiness of the water, we could clearly see his scaly shadow bobbing just beneath the surface. Had the sun been behind the clouds, we’d only have spotted his wide snout, but we were in luck today. For the second time in a few hours, we were stunned into silence at the sheer grandeur of this Jurassic beast. Not wanting to anger Scarface or interrupt his courtship further – and knowing we’d had more than our fair share of wildlife sightings from the day – Jarrah returned us to the jetty, stopping to spot kingfishers and herons as he went. 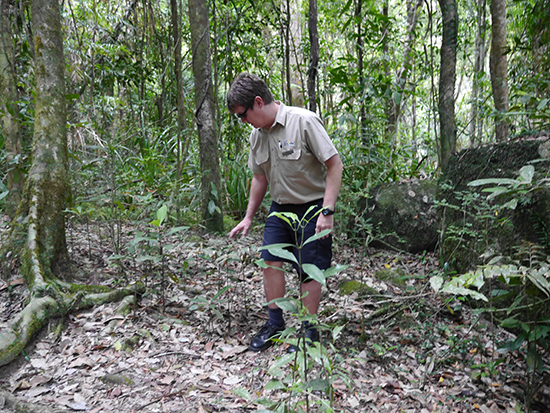 Want to explore Daintree, Mossman and Cape Tribulation? 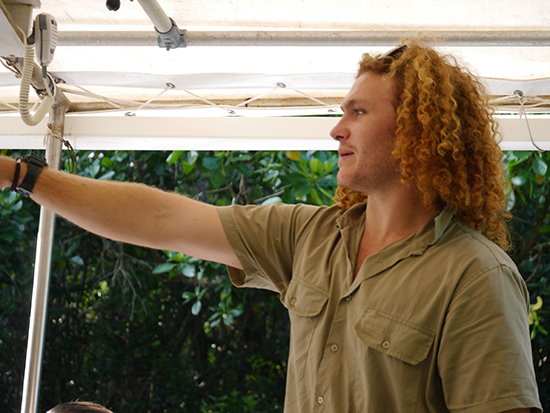 You can do all this and more on our Tropical North Queensland Journey. Speak to one of our Experts about booking your trip today.